petagrams of carbon (PgC) per year (y-1) from the atmosphere. This net sink is the residual of a land use change flux of the order of 1.2 PgC y-1 (DeFries et al. 2002) and an inferred uptake of the order of 1.8 PgC y-1 (Table 2.1 and Colorplate 1 in Sabine et al., Chapter 2). Assessing the responses of the terrestrial carbon cycle to the projected climate and human factors in the 21st century will require separating the processes that lead to sources from those that lead to sinks. This attribution task is complicated, because the carbon balance on land is, in general, a small difference between large fluxes in and out. As a consequence, modest proportional changes in fluxes in or out of a pool can have a large impact on the magnitude of the residual sink. Living biomass on land contains about 650 PgC, which is slightly less than the amount of carbon in the atmosphere. With an average residence time of about 10 years, the turnover of this pool is relatively fast, making a substantial fraction of this pool potentially vulnerable on timescales of decades to centuries. It is also likely that most of the carbon gained by the terrestrial biosphere over the past few decades has entered this pool and has not progressed in any substantial manner into the longer-lived soil pools (Schlesinger and Lichter 2001). The biomass pool can expand only slowly as a result of increased plant growth or decreased disturbance, but this pool can be degraded quickly, especially with natural and human-induced disturbances. As discussed in Sabine et al. (Chapter 2), scientists' perspective on the current terrestrial carbon balance has changed dramatically over the past decade. A decade ago, it was assumed that the entire land sink is a result of CO2 fertilization, and perhaps warming (Houghton et al. 1990). This view has been supplanted by an appreciation of the fact that the current and future land sinks are most likely the result of many factors, including land use history and land cover management, and that CO2 fertilization is likely smaller than previously assumed (e.g., Pacala et al. 2001). These changes in knowledge are only beginning to be incorporated into terrestrial carbon cycle models (McGuire et al. 2001). In both the Hadley and IPSL models discussed earlier (Cox et al. 2000; Dufresne et al. 2002), CO2 fertilization is assumed to be the main driver of the present and future terrestrial carbon sink. In the absence of climate change, the projection from these two models is that CO2 fertilization would be responsible for a cumulative land uptake of 600 PgC for a doubling of atmospheric CO2 (Friedlingstein et al. 2003). In the Hadley model, a substantial fraction of the carbon that is being released back into the atmosphere as a result of surface warming comes from soil pools that have grown significantly during the 20th and 21st centuries as a result of CO2 fertilization. Projections of large sinks from CO2 fertilization are difficult to reconcile with the present understanding of the current land carbon cycle, where a number of constraints (Field et al. 1992) are likely to limit potential land sinks from CO2 fertilization to the order of 100 PgC over the next 100 years. The contribution of land use history to the future land sink is rather uncertain. In general, forest sinks due to regrowth of previously harvested forests tend to saturate as a forest matures or are rapidly converted to large sources in forests disturbed by fire, storms, or disease. Key controllers of the future trajectory of sinks in Northern hemisphere forests include the forest age structure, changes in the disturbance regime, and changes in management (Nabuurs, Chapter 16, this volume). The land sink in the 21st century as a result of historical land use change is, at maximum, on the order of 170 PgC (House et al. 2002). This amount assumes that all carbon lost as a result of the past land use change could be stored back on land. A realistic estimate should be less than half this number, since humans still use most of the land deforested in the past and since the land not used for food production is often of poor quality. From the perspective of the carbon budget of the 21st century, a slowing of deforestation has the same effect as a decrease in fossil emissions or an increase in a land or ocean sink. In addition, reforestation and afforestation may be increasingly important aspects of future carbon management. The extent to which new forest sinks can be realized must be consistent with other societal constraints on available land (Raupach et al., Chapter 6, this volume). The need for expanded areas for agriculture and for replacement of degraded agricultural lands, plus constraints of climate and water availability, are likely to be profoundly important. Given these constraints, reforestation and afforestation are likely to continue to generate carbon sinks throughout the 21st century, but their magnitudes are unlikely to be much more than a few Pg for the next 20 years and a few tens of Pg for the entire 21st century. Woody encroachment, including the establishment of trees and shrubs on grassland, as well as the thickening of open forests, has been an important aspect of land dynamics on several continents over the last century (Sabine et al., Chapter 2). The driving factors for woody encroachment are too poorly known to support a quantitative estimate of future changes, particularly since its net contribution to atmospheric CO2 can be positive or negative. We expect this process, however, to be a relatively small contributor, and one whose future carbon trajectory will be primarily determined by human actions. Fires are a major factor in the terrestrial carbon cycle, annually returning more than 3 PgC to the atmosphere (see Colorplate 1 of Sabine et al., Chapter 2). Because fire has always been a part of the land biosphere and recovery from fires is slow, its role as a carbon source or sink depends on fire frequency and intensity trends over decades to centuries rather than on present burning. Over the past few decades, some regions have probably experienced carbon sinks as a consequence of the success of fire suppression (Sabine et al., Chapter 2). It is unclear whether this trend will continue, as fuels accumulate. We believe that the carbon sink that arises from fire suppression is going to be very small in this coming century but that an increase in fire frequency and intensity is a significant concern (see below). In summary, the sink potential in living terrestrial biomass over the next 20 years is modest, on the order of a few tens of Pg. Terrestrial sinks may grow somewhat from current levels, but societal and natural limits from land use, fire, and nutrient availability will operate as constraints. Over the next 100 years, some mechanisms and societal drivers contributing to land sinks will continue to operate, but not all (see Raupach et al., Chapter 6, this volume) giving rise to a maximum potential sink of the order of 150 PgC. The carbon pools on land also have the potential to release substantial amounts of carbon into the atmosphere. Many of the mechanisms that are responsible for generating current sinks are closely related to mechanisms that can lead to future sources of carbon to the atmosphere. Probably the largest future vulnerability of land pools arises from land use change and deforestation, particularly if the world develops along lines similar to those described in the A2 story line—that is, a world in which countries develop in a very heterogeneous pattern. The exact magnitude of the pools at risk is difficult to assess, but we expect that the carbon stored in the living biomass in tropical and subtropical ecosystems is the most vulnerable. Based on past trends, we estimate that on the order of 40 PgC carbon stored in the living biomass might be at risk over the next 20 years, and up to 100 PgC over the course of the 21st century. More subtle changes to land ecosystems, such as human-induced degradation and increases in mortality due to pests might increase this estimate, but probably not by a significant amount. Deforestation has a number of other implications for climate and the carbon cycle. One set of effects concerns albedo. Boreal deforestation leads to large increases in albedo, with a cooling effect that may be larger than the warming related to the CO2 release (Bonan et al. 1992; Betts et al. 1997). In the tropics, the albedo effect is much smaller, and effects of rooting depth on transpirable soil moisture may feed back to increase local temperature and decrease precipitation (Shukla et al. 1990). Finally, deforestation also removes the potential that growth of an established forest can serve as a carbon sink. A second important mechanism that could lead to substantial losses of carbon from the terrestrial biosphere is the redistribution of species and biomes as a result of climate change. It is estimated that the entire terrestrial biosphere gained about 500 PgC between the last glacial maximum (about 20,000 years ago) and the ensuing Holocene (Sigman and Boyle 2000). Whereas the postglacial warming of about 5K occurred over 10,000 years, however, global warming over the next century might result in a similar temperature change, but over a timescale of 100 years. This climate perturbation is likely to occur at a rate exceeding the capacity of plant species to adapt, resulting in a total rearrangement of species and communities. This change will result in transient carbon losses that can eventually be recovered, but only over a much longer timescale (Smith and Shugart 1993). In the Northern Hemisphere, a warming may lead to a forest dieback at the southern boundaries of presently forested regions, although increase in spring or fall temperature may extend the growing season length of temperate and boreal ecosystems. Invasive species could spread in these regions. Direct human action on species composition, however, including establishment of plantations of non-native "exotic" species, is also likely to continue. The net effect on carbon reservoirs is difficult to estimate but is more likely to be a source than a sink, and the total forest area is more likely to shrink than to expand. In the tropics, warming and increased aridity may lead to a size reduction of the tropical forests (Cox et al. 2000). Given that tropical forests contain the largest carbon pool of terrestrial biota and also the largest net primary production (see Table 2.2 in Sabine et al., Chapter 2), this reduction will likely lead to a release of carbon to the atmosphere. In summary, we estimate that on the order of 40 PgC carbon stored in the living biomass might be at risk over the next 20 years, and up to 100 PgC over the course of the 21st century. This risk arises mostly from deforestation and other anthropogenic land use changes, An additional 10 PgC (20 years) and 100 PgC (100 years) is probably at risk as a result of climate change—that is, the inability of communities to adapt to a changed climate. Soil carbon is by far the largest carbon pool in terrestrial ecosystems. As summarized in Colorplate 1 of Sabine et al. (Chapter 2), about 2300 PgC is stored in the upper 3 meters (m) of tropical, temperate, and boreal soils. Carbon stocks in wetland and permanently frozen soils are much less certain and are usually not included in carbon cycle models. These stocks are in the range of 200-800 PgC in wetland soils and 200-800 PgC in (nonwetland) permafrost soils. There is therefore more than five times more carbon stored in soils than in the living biomass on land. This large organic carbon reservoir is the result of a delicate balance between biomass accumulation by photosynthesis and oxidation by respiration. Most of this soil carbon is in long-lived pools and therefore relatively inert. Over the course of this century, however, a substantial fraction of this pool might be mobilized. Given the very different dynamics of the various soil pools, we review separately the wetland, the frozen, and the "other" soil pools. Carbon sequestration in soil can be achieved through changes in agricultural practices (i.e., no tillage) or with land use changes, such as reforestation of degraded lands. The global potential for carbon sequestration in soils is estimated to be about 0.9 ± 0.3 PgC y-1, with different patterns and rates in European cropland (Smith et al. 2000), U.S. cropland (Lal et al. 1998), and degraded lands (Lal 2003). These estimates of carbon sequestration potential do not account for limitations due to land use, erosion, climate change or economic, social, and political factors (Raupach et al., Chapter 6, this volume). Increased net primary production (NPP) resulting from fertilization of plant growth by elevated CO2 and nitrogen deposition will tend to increase soil carbon. If these increases are not offset by increased decomposition in a warmer climate, the equilibrium increases in soil carbon should reach the same proportional size as the NPP stimulation. Assuming a fertilization effect of the order of 20 percent of NPP and equilibrium conditions for organic matter decomposition, the maximum possible increase in soil C from CO2 and N effects is on the order of 300 PgC over the 21st century. This is considerably smaller than the more than 600 PgC accumulation simulated in the Hadley model. Losses of soil carbon can be caused by decreased inputs from NPP, accelerated decomposition, and increased losses from erosion and combustion. Each of these mechanisms has human and natural drivers (e.g., deforestation, increasing energy consumption, diversion of water bodies). Boreal soils contain huge stocks of carbon. These stocks could increase if tree growth increases in a warmer climate (Dufresne et al. 2002), but they could also decrease, especially if increases in decomposition are larger than increases in NPP or if an increase in fire frequency and magnitude reduces the input of carbon to the soil. Increasing temperature and more frequent droughts (due to increase of climate variability) can enhance desertification in subtropical and tropical regions, stimulating losses of soil carbon. Soil erosion due to changes in the hydrological cycle is also a major disturbance to soil carbon in the semi-arid regions. Climate regulates carbon release by soils through effects of temperature and soil moisture changes. The way in which these two factors interact, however, is highly nonlinear and often opposite (i.e., a temperature increase will increase soil carbon losses while a soil moisture decrease will reduce decomposition but increase soil temperature). In areas where increased temperature and associated drought are expected, the predictions of increased losses of soil carbon losses are debatable. The two coupled climate-carbon simulations from Hadley and IPSL simulate a total loss of soil carbon as high as 600 PgC by the end of the 21st century. As stated earlier, however, these estimates should be seen as unlikely upper estimates as the carbon release is fueled by a large accumulation of soil carbon, resulting from CO2 fertilization. We estimate from FLUXNET data (Sanderman et al. 2003) that about 8 kilograms (Kg) C per square meter (m-2) in 100 years could be potentially released by soils as a result of changes in climate, assuming a temperature change of 4°C. This amount reflects a potential loss of about 280 PgC in the next century. Land use change, however, is the major driver of carbon losses in the soil. Since 1850 between 45 and 90 PgC (Houghton et al. 1999; Lal 1999), have been lost through cultivation and disturbances. One of the main characteristics of land use effects is that carbon fluxes are pulsed in response to disturbance frequency and intensity. The effects of such pulses can persist for several years after disturbances and are usually one of the major uncertainties in current models. Land use change pulses of carbon are also directly influenced by climate-human interactions (i.e., desertification, which is the result of human pressure and aggravated temperature and water impacts). Thus the interaction of direct human effects with climate impacts can amplify the carbon losses, particularly in developing regions. An analysis of recent studies on the impact of land use conversion on soil carbon stocks suggests that up to 50 percent of the total pool of soil carbon can be lost in 50—100 years after conversion (Schulze et al. 2003). Of course not all the land use changes occur in organic rich soils. We therefore estimate that about 25 percent of the total soil carbon pool is vulnerable over the course of this century, equivalent to about 400 PgC. Wetland carbon fluxes are controlled by climate and land use change. Climate drivers include temperature effects on carbon and other greenhouse gas (mainly CH4) fluxes. 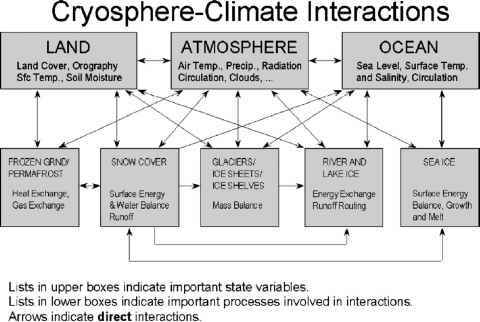 In addition, changes in hydrology can have pronounced effects on both carbon and other greenhouse gas fluxes. Temperature increases stimulate both CO2 and methane emissions, while changes in the water table have contrasting effects on those two fluxes. Drainage stimulates oxidation of organic material and release of CO2; in contrast, increasing water levels reduces CO2 emission but stimulates anaerobic decomposition and methane fluxes to the atmosphere. To estimate the vulnerability of wetland pools of carbon to climate effects requires a detailed analysis of the interaction between CO2 and other trace gases. The global warming potential (GWP) of methane is about 20 times larger than that of CO2. Therefore, a change in the ratio of methane to CO2 respiration will have a climate impact. Christensen et al. (1996) showed that large northern wetlands, for example, are leading to a net increase in radiative forcing because of their large methane emissions even though they are a net carbon sink. On a global scale, this net source of radiative forcing is equivalent to about 0.5 PgC y-1. Assessing the future evolution of the wetland and peatland emissions of CO2 and CH4 is very difficult, as this depends critically on temperature and water levels. If we accept the climate projections that regions that are already receiving substantial rainfall will receive even more in a future warmer climate, then we would expect an increase in the water level, stimulating the production of methane. In addition, higher temperatures would lead to an increase in respiration rates. Both factors conspire to give a relatively high sensitivity of the carbon pools in wetlands and peatlands. A rough estimate is that a CO2 equivalent of about 100 PgC will become vulnerable in the next 100 years. An interesting aspect of the interaction between CO2 and CH4 emissions in both natural and human-managed wetlands and peatlands is that drainage control provides the possibility of generating a sink potential, as a lowered water table reduces CH4 emissions at the expense of an increase in the CO2 emissions. Other environmental concerns (loss of biodiversity, habitats, etc.) should also be considered, however. Permanently frozen soils contain a very large pool of carbon, the result of a gradual accumulation over thousands of years. As long as these soils are frozen, the carbon they contain is essentially locked away from the active part of the carbon cycle. When they thaw, however, the carbon becomes vulnerable to rapid loss. Using results from several climate models, all scaled to a global mean warming of 2°C, Anisimov et al. (1999) estimate that the area of permafrost could shrink by about 25 percent. They also estimate an increased summer thaw depth in the areas that maintain permafrost. Current knowledge is too incomplete to convert this loss of area into a loss of carbon, but the pool of carbon vulnerable to this relatively modest warming could total more than 100 PgC. If a substantial fraction of the C loss occurs as methane emissions, as is typical of wetlands, the impact on radiative forcing will be amplified. Assuming that total permafrost carbon is 400 Pg and 20 percent is lost in the next century, the potential release is 80 PgC.